A plea for formalized languages in biology. 2009 was a big year for synthetic biology in the academic press. 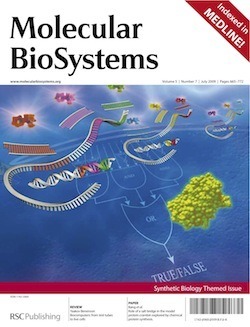 Several journals had special issues devoted entirely to the topic, most recently Nature Biotechnology, but also Molecular BioSystems, The Journal of the Royal Society Interface, Systems and Synthetic Biology, and EMBO Reports with excellent research articles, reviews, and fascinating commentaries on economic, ethical, and social issues in synthetic biology. Beyond that Google Scholar returns over 1,000 results for “synthetic biology” in 2009, most of which I unfortunately have not had the chance to read. Of the few hundred where I at least read the abstract I have collected my favorites, the TOP 12 PAPERS IN (broadly defined) SYNTHETIC BIOLOGY OF 2009 (according to one grad student)!!! They’re numbered for convenience more than anything, I couldn’t possibly rank them more specifically, deciding on this few was hard enough. If you have favorites that I missed, please add them in the comments! 1.) 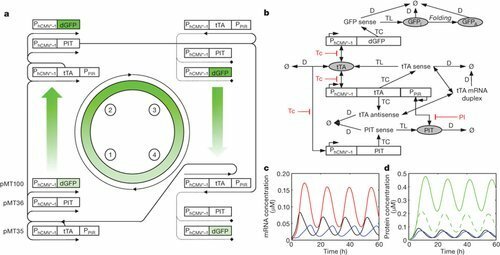 A tunable synthetic mammalian oscillator, Tigges et. al. Nature, 457, 309-312. You maybe could tell that I am partial to oscillators, the darling of synthetic biology circuits. Oscillators are cool because they are hard to make, have a clear analog in electrical engineering, are important in many natural biological systems (for a really cool article about circadian rhythms and you, check out Olivia Judson’s New York Times blog post), and could be used as a component for future synthetic systems where timing is important. 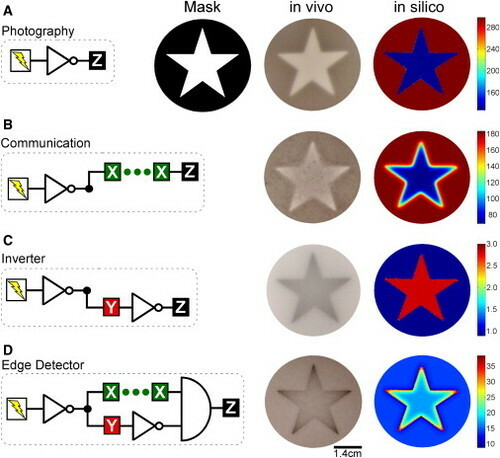 This paper from Martin Fussenegger’s group is the first robust, tunable synthetic oscillator in mammalian cells; that is, individual cells will glow on and off for many cycles with a time period that can be changed by the experimenter. It’s a big step in terms of oscillator design, and future work will further improve the oscillations and allow for synchronized behavior between populations of cells. 2.) A synthetic mammalian electro-genetic transcription circuit, Weber et. al. Nucleic Acids Research, 37(4) e33. Another paper from the Fussenegger group, this one is interesting because it brings a new input system to mammalian cell engineering: electricity. It’s not a direct electrical input, as with voltage gated channels (which I think would be cooler, but also requires using specific cell types), but uses the indirect electrochemical breakdown of ethanol to acetaldehyde to activate a synthetic gene network through a promoter that responds to acetaldehyde. 3.) Programming cells by multiplex genome engineering and accelerated evolution, Wang et. al. Nature, 460, 894-898. Optimization of synthetic (or natural) metabolic pathways for the highest possible production of a desired product can be tedious and extremely time-comsuming work. Researchers from the Church lab at Harvard created a robot that would automatically perform cycles of mutating E. coli genomes and then selecting for cells that produce more lycopene (an important industrial chemical). In a matter of hours they were able to test billions of variations and come up with an optimized pathway that makes more lycopene than the natural system and synthetic pathways that have been more laboriously engineered. 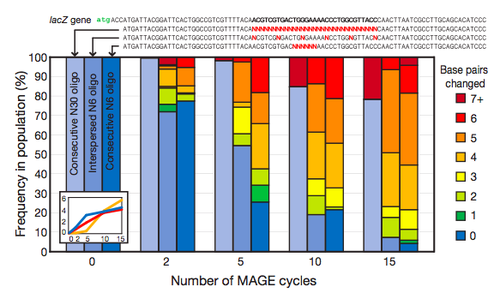 This Multiplex Automated Genome Engineering (MAGE) method has the potential to make the dream of fast, easy biological engineering a reality by automating directed evolution on a genome scale. 4.) Synthesis of methyl halides from biomass using engineered microbes, Bayer et. al. JACS, 131(18), 6508-6515. Synthetic biology blurs the lines between species, treating natural ecosystems as bags of genes to be mined and annotated, searched and modeled, synthesized and networked. It’s hard to tell from the sequence alone though how good an enzyme from a certain species will work in your chassis, how it will cooperate with the other components in your pathway, whether it will even function at all. 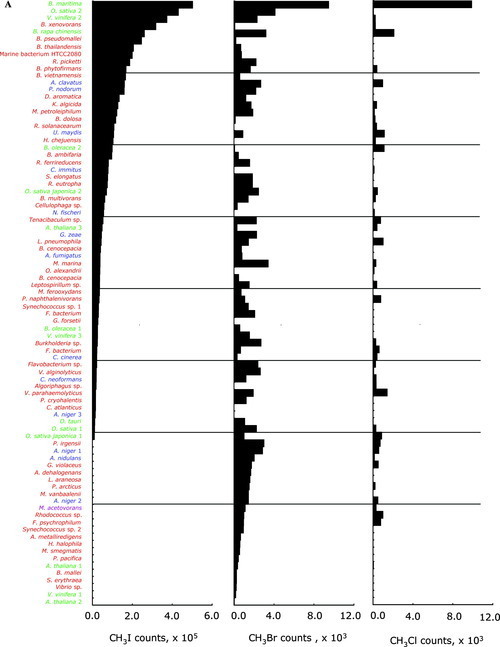 This paper from the Voigt lab deals with just that problem with brute force testing of ninety variants of a single enzyme, collated from genomic datasets and synthesized chemically for expression in E. coli. It’s incredible for the scope and scale, for the output—very high levels of methyl halides, precursors of many important chemicals including fuels—and for the work towards improving our understanding of enzyme function vs. sequence (and the idea that it’s going to take a lot more than bioinformatics alone to get the job done). 5.) Synthetic protein scaffolds provide modular control over metabolic flux, Dueber et. al., Nature Biotechnology, 27, 753-759. 6.) A synthetic genetic edge detection program, Tabor et. al. Cell, 137(7), 1272-1281. “printing” an image onto a petri dish covered in the cells. This paper improves on the old design with the addition of many new abstractable transcriptional logic components. Instead of every cell that experiences the light turning color, the bacteria only activate color production when they experience something different from their neighbors, so that only the edges of the lit-up area turn dark. It’s a neat little system, and represents a very sophisticated and compex synthetic network made up of many components. 7.) Spatiotemporal control of cell signalling using a light-switchable protein interaction, Levskaya et. al. Nature, 461, 997-1001. Light can also be used to activate synthetic pathways in mammalian cells (!!!). This paper is great, it introduces a totally new way of interacting with mammalian cells and it introduces a new functional “part” for synthetic biology, controlling the cytoskeleton to directly alter the shape of the cell. Awesome! This one is a little biased (it’s from my lab), but it’s a neat paper that uses metabolic modeling in order to find non-intuitive gene deletions that would increase metabolic flux through the formate production pathways in yeast (formate is an industrial commodity and is can be efficiently converted to hydrogen gas by E. coli). The modeling is called flux balance analysis, which uses only steady state information about metabolism in order to find optimum “solutions” to how the cell allocates resources. It’s an interesting way to solve the problem of first of all collecting all the data and second of all having enough computational power to actually model metabolism as the dynamic system that it is, and it can be used for rapidly generating interesting hypotheses and designs for metabolic engineering. 9.) Snowdrift game dynamics and facultative cheating in yeast, Gore et. al. Nature, 459, 253-256. This is one of my new favorite things—evolutionary dynamics of symbiosis using synthetic “ecosystems” of several species of microorganisms that “cooperate” or “cheat” by using the environment’s resources without giving other cells anything in return. It’s a fascinating look at how cooperation may be more “natural” than we think, and that evolution and natural selection don’t have to be just about bloody and selfish competition for survival. Expect a lot more about this from me in 2010! 10.) Measuring the activity of BioBrick promoters using an in vivo reference standard, Kelly et. al. Journal of Biological Engineering, 3(1). It’s hard to believe that this paper only came out in 2009, because this kind of foundational work on characterizing BioBrick parts is so critically important for the engineering of biological systems. 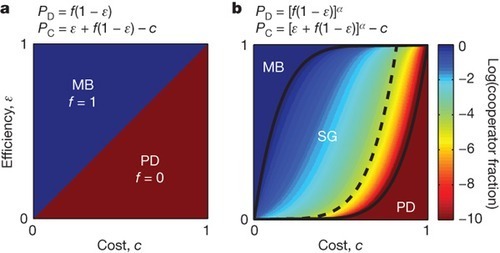 Almost every project in synthetic biology involves an extended period of optimization, and kinetic components such as promoter strengths are a main focus of such efforts. With a standardized, reproducible method for comparing different promoters, it will be much easier to choose parts “off the shelf” for future synthetic biology project. There is a lot more work to be done, and it will need a lot more papers (or specification sheets?) like this. 11.) Solving a Hamiltonian Path Problem with a bacterial computer, Baumgardner et. al., Journal of Biological Engineering, 3(11). This paper comes from the 2007 Davidson-Missouri Western iGEM project, where the students used engineered genetic systems in bacteria to solve an NP complete problem. Cool! 12.) How to choose a good scientific problem, Uri Alon, Molecular Cell, 35(6), 726-728. To round out the list, the least synthetic biology paper, but a thought-provoking, important, and wonderfully touchy-feely look at nurturing good scientists as a mentor and good advice for students for choosing interesting and important problems to study and how to go with the flow when things inevitably don’t work as planned. That was 2009, here’s to a happy, healthy, intellectually stimulating 2010! Daniel Reda- Introduction to Biotechnology and Bioinformatics from the Singularity University. It’s about an hour and a half long, but worth a look if you’re interested in some general introduction to biology. No, they’re not chewed-up pieces of gum, quit salivating. These are the world’s first transgenic prairie voles, which were injected with a jellyfish gene as embryos, resulting in glowing baby voles. Researchers inserted the prairie vole genomes with a glowing jellyfish’s gene, which contains a fluorescent protein that makes it glow. Once the embryos grew into prairie voles, the jellyfish gene was evident in its glowing skin, and even their children had similar strengths of luminescence. These prairie voles will help scientists discover genetic secrets of pair bonding, social behaviors, understand psychiatric disorders better, and also intrigue and fascinate. Look! Glow in the dark voles! Biojewellery: Designing rings with bioengineered bone tissue. Bone tissue cultivated outside a patient’s body will soon be used in reconstructive surgery. As the bioscience behind this application develops, the promise of the technology provokes curiosity and speculation about alternative uses. Biojewellery explores such an alternative, providing couples with a symbol of their love. Biomedical engineers, designers and clinicians set out to create unique biojewellery rings for couples. Bone tissue was cultured in a hospital laboratory, using cells from chips of bone donated by the couples during wisdom tooth extractions. The bone was combined with silver to create the rings. "A standards war is brewing in the gene-synthesis industry. At stake is the way that the industry screens orders for hazardous toxins and genes, such as pieces of deadly viruses and bacteria." Next-generation sequencing provides the most accurate estimate to date. Escherichia coli K-12 substr. MG1655 Enzyme: tyrosine aminotransferase: Gene-reaction schematic. I'm currently working on making these graphs less ugly!